On a cold day there is nothing better than a hearty bowl of warm soup! 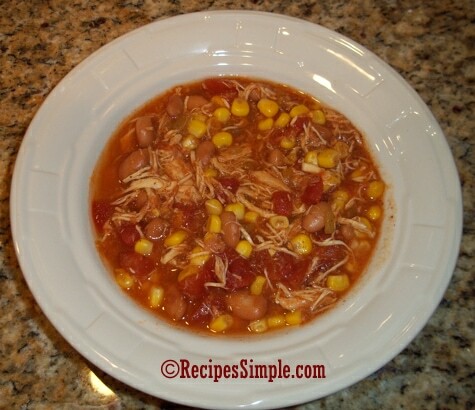 This Slow Cooker Mexican Chicken Soup uses basic ingredients that are slow cooked to perfection. We like to serve it with Mexican blend cheese sprinkled on top and tortilla chips. This recipe calls for black beans but you can substitute your favorite bean if you prefer. I did not have any black beans so I added pinto beans instead. Place chicken in slow cooker. Add all remaining ingredients. Remove chicken and shred. Place shredded chicken back in slow cooker and stir well. Serve with warm bread or tortilla chips and your favorite toppings. Found you at Southern Mom Cooks!! Thanks! So glad you stopped by! This is one of our favorite soups. So good!